Gavin Whyte has followed the Stuart Dallas route to international recognition and now both wingers are hoping to fire Northern Ireland to the Euro 2020 finals. The former Crusaders heroes have shown there is a pathway from the Irish League to the professional game and Leeds United ace Dallas has been impressed by Whyte's progress at Oxford United. 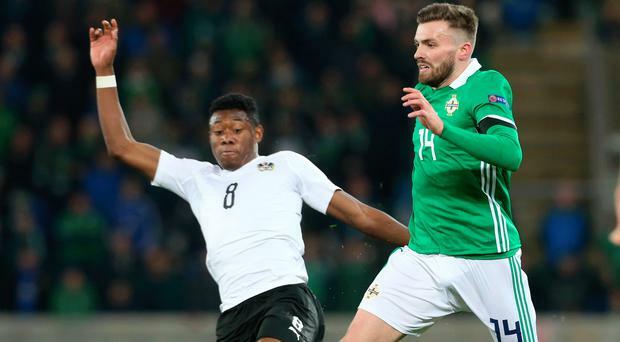 Whyte has hit the ground running in League One and the highlight of his career to date is scoring with his first touch for the Northern Ireland senior side in September last year during a 3-0 win over Israel. The winger's game has developed at a fast rate and if he can overcome a thigh injury, he hopes to shoot down Estonia tonight and Belarus on Sunday, both at Windsor Park. Cookstown man Dallas, who moved from the Crues to Brentford in 2012, is expecting more fireworks from the Belfast man. "Gavin has done very well," said Dallas. "He always had that potential and he got his chance to go to Oxford and hit the ground running. "He's come into the international squad and scored on his debut. The thing about Gavin is that he always gets an opportunity to score, he always gets himself into really good positions at the right time. "He's an exciting kid, a good lad who is always willing to learn and he will only get better." With the Nations League fixtures a fading memory, the serious business starts for Michael O'Neill's men tonight. The pressure is on to win these two opening qualifiers. Failure is not an option. "People will probably look at the group and see Germany and Holland and just think 'Northern Ireland have no chance' but with the way the fixtures have fallen it has given us a lot more confidence," said Dallas who has scored three goals in 36 international appearances. "We've got to win these two games and then the summer becomes massive for us. "Without being disrespectful to the opposition, these are games we have to win and if we can do that and take maximum points it puts us in a good position. In previous campaigns that momentum has helped us and we've shown we are hard to stop. That would then leave the bigger nations coming to us later on in the year needing to win and Windsor Park wouldn't be a nice place to come to, needing a result. "So if we can pick up maximum points, it will put us in a good position and you'd always rather have the points on the board than trying to play catch-up." Like many of his international comrades, Dallas hasn't featured as often as he would have liked at his club. His last start came away at Sheffield United on December 1 when a fractured foot left him frustrated. "I feel good, I feel fit," he said. "The injury was a frustrating time. I broke two toes and I was due to come back after about two months and then suffered a stress response on my heel so they thought that would keep me out for another four to six weeks but I was able to get back in three. "It's been frustrating, though, especially when the team was winning and you weren't a part of it but it's great to be back now and I feel good. "I've come on in every game since I've been back so I'm still getting game time no problem. At our place, if you don't play on a Saturday, a certain number of minutes, you automatically play for the reserves on a Monday so you still get that game time, albeit at Under-23 level but you still have to put a shift in." Does he worry Northern Ireland's intensity and tempo may drop given some players' lack of match sharpness? "Michael wants us to play that way," he added. "We are only here for two games this week and we have to make sure we give it everything we have and hopefully the rest will take care of itself. "There are a lot of positives we can take from the Nations League, maybe not results but in terms of performances we played well and can take a lot from it. "It was good experience for the younger lads who came in and they added a freshness. It was good for them and they are ready to kick on." Goalkeeper Bailey Peacock-Farrell was frozen out of the first team picture at Leeds United but Dallas says his attitude remains first class. "I spoke to Bailey when Kiko (Casilla) came in and told him he's got to understand he won't go through his entire career as a first-choice all the time and to learn from a goalkeeper like Kiko who has been at one of the best clubs in the world (Real Madrid) and won three Champions Leagues," he added. "I think for Bailey to progress even more, he needed to play under a keeper like that. "Obviously he's disappointed not to be playing, he's a young kid who played a lot of games. There's big pressure at Leeds but he has been fantastic." United are chasing promotion to the Premier League. "It's enjoyable," said Dallas. "You'd much rather be challenging for promotion than in a dogfight at the bottom end of the table. We are under no illusions about how hard it's going to be and everyone is capable of beating everyone else in that league. "But everyone keeps thinking Leeds are going to blow up but I can assure you now we won't. "When you have something to fight for like a place in the Premier League you can't give up. The boys are still positive despite losing to Sheffield United and we've shown we are one of the best if not the best team in the league and hopefully we can show that in the last eight games."